The Anonimo watch company was founded in the Tuscan city of Firenze (known as ‘Florence’ by English speakers) in 1997 by designer and entrepreneur Federico Massacesi. His vision was for his new company to become known as the premier Italian producer of high quality mechanical timepieces. Shortly after its inception, events conspired to further his cause when the Vendome Group (who were themselves later subsumed into the Richemont Group) took over the local competition. The Vendome group moved the design and production of Panerai watches away from the Italian city to Switzerland, leaving behind many of its craftsmen. Anonimo absorbed these watchmakers, allowing them to continue their regional craft-making traditions and in doing so adding a strong technical base to their company. Naturally Anonimo continues to use the skills of those and other local craftsmen and its operation is spread throughout the Tuscany area. The Ox-Pro case uses a sand-blasted ‘AISI316 Plus’ stainless steel watch case and bezel. The finish is the result of a 14 stage process that leaves the surface antireflective and protected from corrosion. It was developed by the military as a non-reflective treatment for optical instruments. 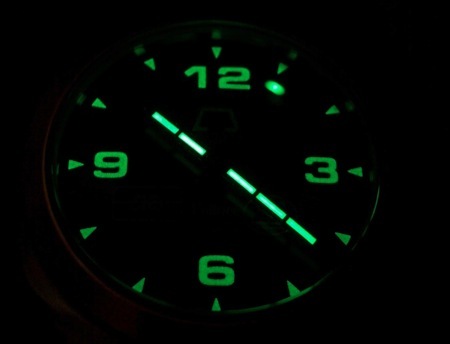 Ox-Pro differs from PVD in that rather than being a coating bonded to the surface, it is an electrical and chemical technique that blackens the metal at a molecular level. The metal itself becomes darker and darker as the process takes place until the item is very dark grey, almost black. 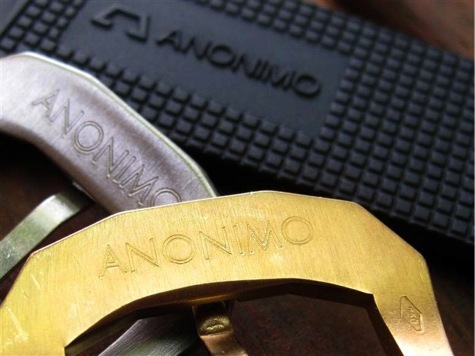 The Italian word ‘Anonimo’ (a Latin derivation of the Greek word ‘anōnumos’) translates to English as ‘anonymous’. 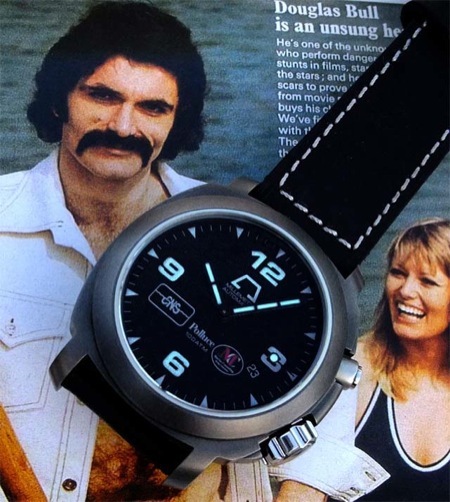 The company name is said to derive from Federico Massacesi’s fundamental philosophy for the company which is based on the concept that the watches Anonimo creates are not to be a statement about the company itself, but are instead “about the individual who wears them and are a testimony to, and an expression of, the personality of the wearer”. Anonimo produce less than 4000 watches each year, with the sales split being half in the USA, and the other half across the rest of the world. Anonimo offer only low volume limited edition cult watches, these limited edition models are sought after timepieces and sell out quickly. 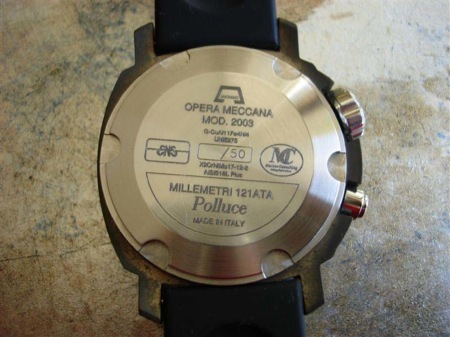 In common with the Millemetri, upon which the Polluce is based, there is no rotating timing bezel. 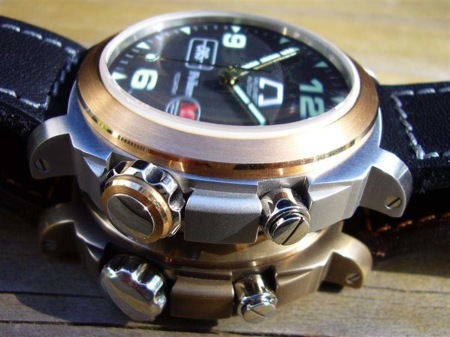 This may seem like a retrograde step for a dive watch and for some this would relegate the Polluce to being a ‘dress’, rather than a ‘dive’ timepiece. However, the lack of rotating bezel is in common with the original Panerai divers watches, and it is worth remembering that CNS, who helped test it, also choose to wear this design as their issued dive watch. per i Beni Archeologici della Toscana to salvage what was left inside and around the wreck. This operation was financed by a number of sponsors including Marine Consulting srl, Cooperativa Nazionale Sommozzatori (C.N.S. ), Capmar Studios, and the Comune of Porto Azzurro. 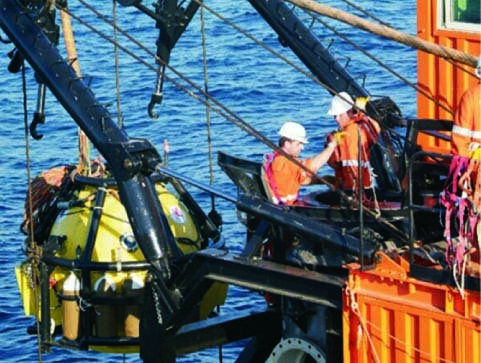 It became a highly significant national event as it was the deepest archeological diving operation to date, the first time a consortium of private companies was involved in the retrieval of cultural and artistic heritage artefacts and the first real treasure to be found in Italian territorial waters. 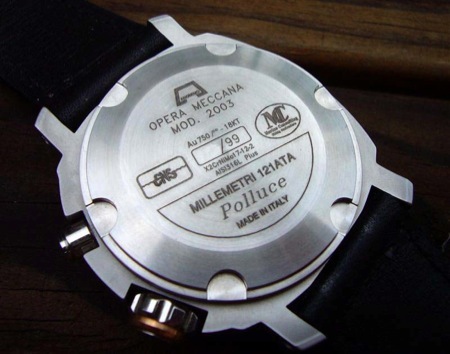 All Polluce models have an engraved edition number on the case back. Anonimo limited edition ranges start with the number 0. ie. ‘0/99’ is the first of the Two Tone Polluce’s, with 99/99 being the 100th and last. 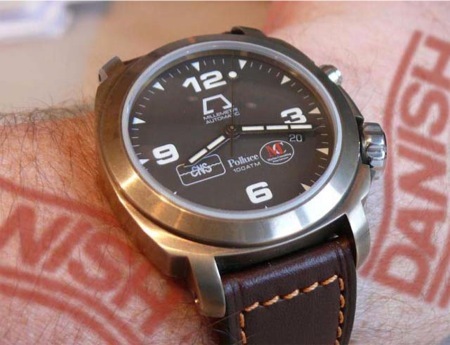 As with many Anonimo models, watches have come to light with an edition number that starts with a 'P' or ‘XP’. This special numbering denotes that the watch is from the prototype or pre-production run for that model, and these are only manufactured in small quantities, approximately 10% of the full run. It is sometimes possible to find these models on the open market. Industry partnerships such as this allow Anonimo to collect data to review the performance of new models. The data gathered being used to improve the design and quality of Anonimo’s diving watches. This testing has included the successful submersion of two Anonimo Millemetri’s to a depth of 2100 meters whilst attached to a radio controlled submarine off the coast of Augusta, Sicily, in October 2002 by the Istituto Nazionale di Geofisica e Vulcanologia of Rome. 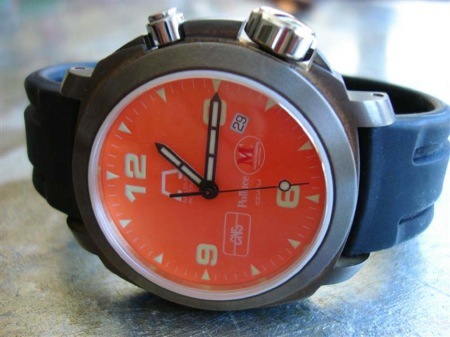 In 1998 Anonimo released a dive watch known as the ‘Millemetri’, which is Italian for ‘Thousand meters’. The watch was a sales success and industry recognition provided the opportunity for Anonimo to develop a close relationship with CNS (Cooperativa Nazionale Sommozzatori) who are internationally recognised as one of the major players in the commercial deep-sea diving industry. 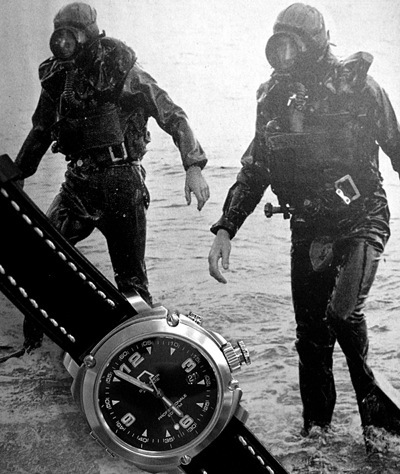 This partnership has provided Anonimo with opportunities to test their dive watches during CNS’s underwater operations in a manner analogous to the role COMEX played with Rolex and Omega in the late 1960’s and early 1970’s during the development of the Rolex Sea Dweller and Omega PloProf. CNS not only endorses, but also utilises, Anonimo dive watches when working at depth. The partnership has been key to the development of Anonimo’s Professionale, Hi-Dive, and Polluce models. 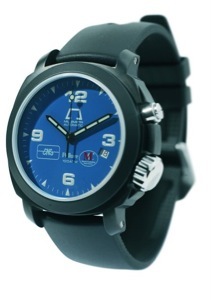 For example the first 50 of the limited run of 250 Professionale models were issued to CNS divers. 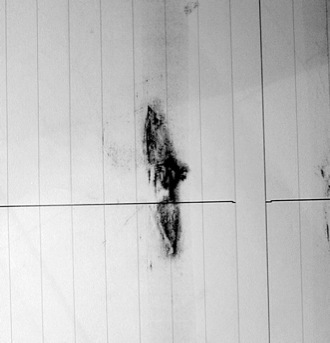 In their articles on the subject, authors Enrico Cappelletti and Gianluca Mirto suppose that the sinking was very probably “not completely accidental”. They report that it was caused by a rival shipping company for “economical and political reasons, connected to the revolutionary rebellions of the Italian Risorgimento”. They assert that the huge amount of money and gold on the ship was ear-marked for the revolutionary supporters of Giuseppe Mazzini, and was carried under the full knowledge of the Rubattino Company owners. The Polluce story begins when the long-paddlewheel steamer's keel was laid at Le Havre in 1839. 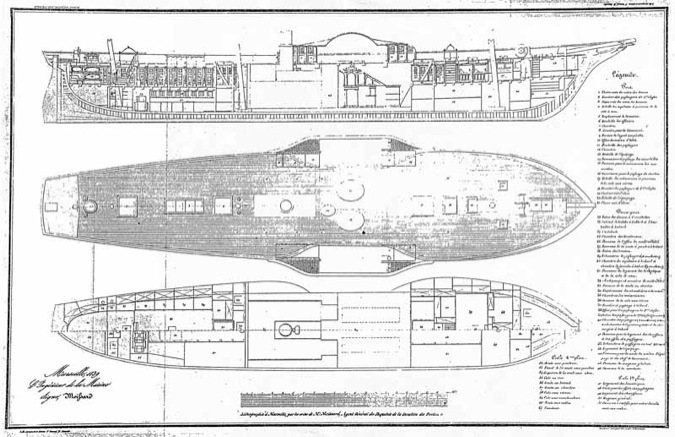 The vessel was approximately 50m in length and constructed of wood. It was purchased by the Rubattino Company who were based in Genova. In April 1841 they began using the ship on their trade routes between Genova, Livorno, Napoli and Marseille. However, on the 17 June after only two months at sea, whilst plying the route between Napoli and Marseille in the Piombino Channel, it was involved in a collision with the Neapolitan steamer ‘Mongibello’ and sank in a matter of minutes. Despite the speed of the sinking, all of the 46 passengers survived the ordeal, but sadly one crew member perished in the incident. Due to the rapid submersion of the ship there was no time to offload the cargo and it sank with its manifest intact. This included gold (reported to be 100,000 coins), silver (reported at 70,000 coins), jewels and cameos, diamonds, emeralds and all the goods that the rich passengers had brought with them. Shortly afterwards a legend began to circulate that a golden carriage belonging to the Contessa de la Rocca of the Borboni family was on board, although other sources maintained it was Ferdinand IV’s. Some months after the shipwreck, the Rubattino Company attempted to recover the steamer's cargo. This was undertaken at considerable expense as the wreck lies at a depth of 103m and was without success due to the rudimentary deep underwater salvage technology of the day. Since that attempt, all references to the co-ordinates of the wreckage appear to have been lost and the Polluce became little more than a treasure hunter's legend. The British group’s attempt was obviously illegal. 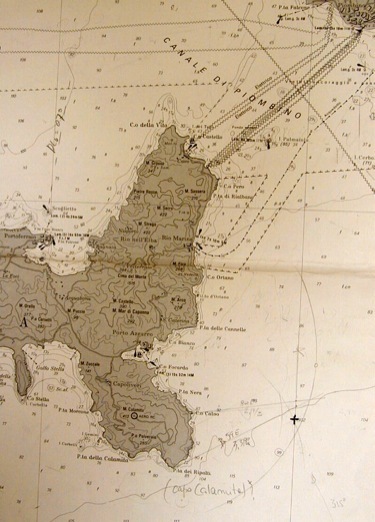 They had filed plans to dive on the wreck of the ‘Glenlogan’ (a British ship sunk in 1916 by a U-boat) which rested over 460 miles away from the Polluce's position. If further proof were needed of their intent, it is understood that they began salvaging her whilst keeping the crew of their hired dive ship in the dark about what they were recovering. With some crew members reporting that they were not allowed on deck during the operation. 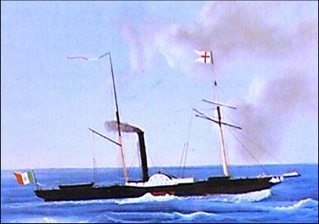 When the salvage was complete the British team unloaded what they reported as “40 tons of lead” and returned to their homes in Great Yarmouth, UK. Amazingly, they would likely have got away with their indiscretions had they not foolishly given an interview to their local paper about the treasure they had found. 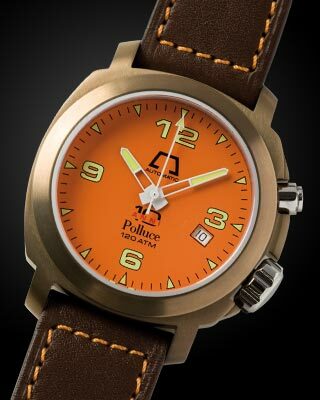 The Polluce limited edition comprises 5 versions, all using the same model designation. The range incorporates special metals/finishes including stainless steel with rose gold, bronze and Ox-Pro treated stainless steel. The bronze version was an innovation for the watch making industry as the bronze alloy used is identical to that traditionally employed in naval construction for items such as ship’s propellers. The use of gold was a first for Anonimo and the decision to use rose gold with it’s deep coppery colour akin to the rich hue of vintage gold, was a tribute to the numerous antique gold items recovered from the Polluce wreck. The Anonimo Polluce watch which is the subject of this article, was released to commemorate the successful rediscovery and salvage of the steamer ship ‘Polluce’ that sank in 1841 in the Tyrrhenian Sea, off the coast of Tuscany. The ship was said to be carrying gold bullion treasure valued at ‘hundreds of millions of dollars’. The story of the Polluce is a convoluted and mysterious drama, to say the least, which has spanned almost two centuries and is an intriguing tale of Politics, tragedy, greed, crime. and finally, good news. That would most likely have been the end of the story, despite the fact that no one really believed that the British team had returned all the treasure that they had raised. However, as seems to be the destiny of this enigmatic vessel, just when it seemed to have once again faded into the annals of history, a new chapter opened. 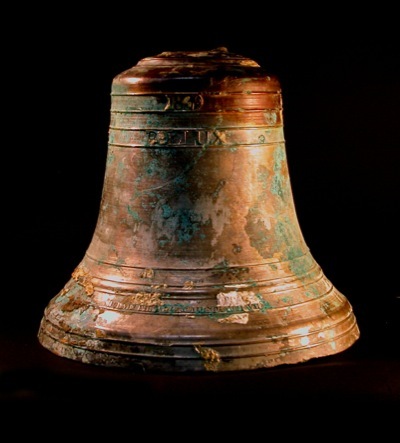 In December 2004 the Polluce’s ship’s bell surfaced in Paris. This was swiftly followed by a joint Italian and French police operation, which traced the bell and more of the Polluce treasure, to the man police had always suspected of selling the co-ordinates, used to locate the shipwreck, to the British divers. At his house, police also uncovered documents and treasure inventories that implicated a number of other people, both British and Italian citizens, who later stood trial. The gang later attempted to sell some, or perhaps all (it may never be truly known) of their haul, as the ‘Santa Lucia’ treasure at an auction set for June 20, 2001. 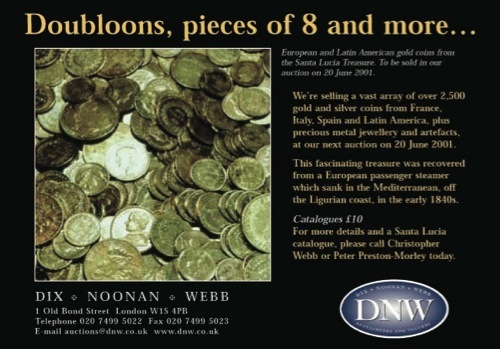 The auction catalogue lists 2000 silver coins, 311 gold coins, diamonds, jewels and silverware. On the 17th of June 306 Auction Lots were seized by the police and on the 19th on June, the group were arrested. CNS and Marine Consulting Srl who both supplied the manpower for the recovery, chose to wear the Anonimo Millemetri timepiece during the operations. Whilst the Polluce models feature different case materials, they share many common features. 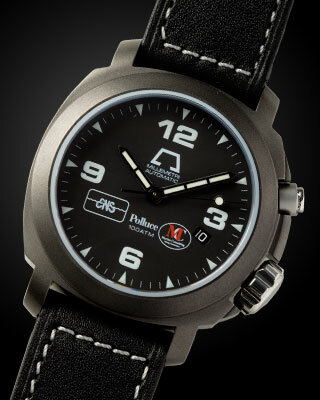 All models use the same ‘AISI316 Plus’ stainless steel screw on case back that is engraved with the model information, CNS and MC logos, case material information and the edition number. It should be noted that some Bronze models use the words ‘Limited Edition’ instead of the MC logo. AISI is the ‘American Iron and Steel Institute’ and the steel they define as ‘316’ grade is specified for surgical uses. It includes molybdenum to help prevent oxidisation and compared to other types of stainless steel it is low in nickel. It is also known as ‘marine grade stainless steel’, due to its ability to resist saltwater corrosion. The large screw down crown is manufactured of solid stainless steel and is easily gripped with gloved hands when preparing for a dive. Situated above it is the automatic helium expulsion valve. The HEV eliminates the risk of explosion, usually manifested as the crystal cracking or lifting off its seals during decompression after a saturation dive. 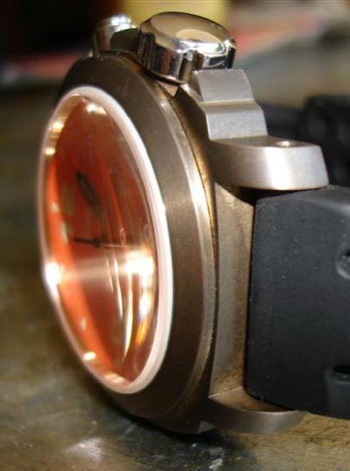 Helium infiltration of the watchcase through the otherwise air/watertight seals occurs whilst in the high pressure, helium rich atmosphere of a hyperbaric chamber. All models use an extra thick domed sapphire crystal, which is held by a chamfered bezel. Despite appearing to be part of the case the bezel is in fact, thanks to the precision of the machining, a separate part that is screwed down onto the case. The stainless steel and gold model uses a sand-blasted and satin finished AISI316-Plus watchcase. The bezel is 18ct rose gold and uses a supporting structure of AISI316L stainless steel. 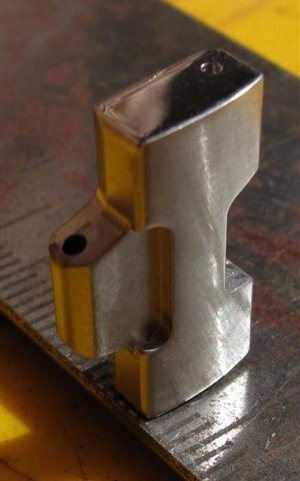 This dual metal structure was required to ensure water resistance. Manufacturing the bezel from solid gold would have meant the bezel threads would have been too soft to be tightened down onto the watchcase at the correct torque. The crown also has an external ring of 18ct rose gold. The upside of making a watch case from this material is that it appears to ‘live’, changing colour over time. The oxidisation of the bronze providing a lovely patina. The downside is that bronze is softer than traditional case materials such as stainless steel and tends to mark and scratch more easily. It is also worth noting that despite its fine mechanical properties bronze is not a particularly people friendly alloy and the oxidisation will mark the wearers skin in a similar vein to wearing copper jewellery. Oxidisation on brass, copper and bronze is also known as Verdigris. For centuries, Verdigris has been used in medicine as a fungicide and also as a turquoise paint pigment, unfortunately it is also poisonous. Whilst there are a number of dial colours and combinations within the Polluce range, the main defining feature of these watches is the variety of innovative materials used to create the watchcase. 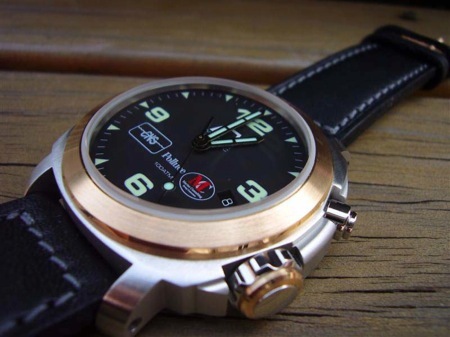 The bronze model has a sand-blasted and satin finished watch case and bezel. Both manufactured from a special bronze alloy. Designated by the Italian national standards authority (Ente Nazionale Italiano di Unificazione (UNI))as UNI 5275. UNI 5275 is a high strength nickel aluminium bronze alloy (CuAl11Fe4Ni4) that has high mechanical resistance and saltwater anticorrosion properties. It is often employed in hi-tech naval applications such as ship’s propellers, pumps, impellers and torpedo parts. Whilst it is accepted that a number of readers may feel that two-tone watches are not for them, this watch is just so well produced that it’s a joy to handle and own. In fact any preconceptions based on any other brand's two-tone models will be firmly blown out of the water. The standard of finish is simply stunning, with the brushed and bead-blasted finishes and the occasional sliver of polished surfaces complementing each other perfectly. An example of this is the exquisite use of alternate brushed and polished surfaces on the rose gold inserts. 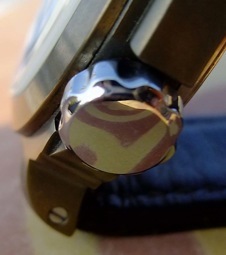 The bezel is brushed on the sloped side, but the top edge and the side (both edges are less than 1mm wide) are polished. The mini ‘bezel’ on the crown has the opposite finishing, as it sits next to the polished stainless steel surface of the crown top. In fact due to this clever finishing, one thing you’re not prepared for when handling one of these two tone models in person, is how ‘anti-bling’ this watch really is, leading to it looking classy and not at all over the top. One nice feature of the large crown is that it makes the watch easy to set, even for those with fat fingers. When fully extended there is only a light hint of wobble which is quite a feat considering the size of the crown versus the standard thickness crown stem. It is smoothly sculpted and well integrated into the case, making it completely comfortable in wear and despite it’s size does not dig into the wearer’s hand at all. Another example of great design. The stated Water Resistance of the Polluce is somewhat ambiguous as the watch dial states it as 100ATM, the literature included with the watch (and the marketing material) state 120ATM and the case back states 121ATA. In an effort to clear up these different values and measurements, one needs to look at the history of this watch and at the different measurements of pressure. 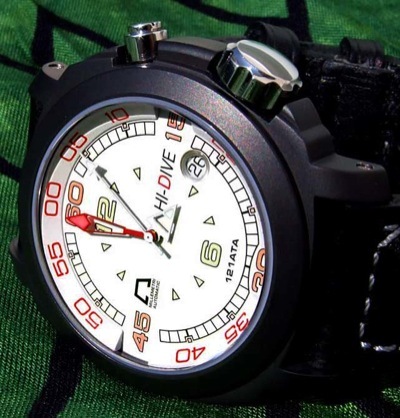 In the Anonimo range the Millemetri is 100ATM depth rated, yet the Millemetri based Hi-Dive is 120ATM rated. 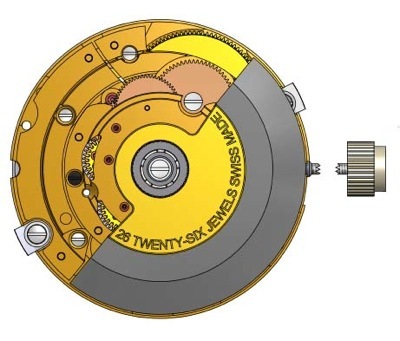 In an effort to explain the fact the Polluce (and Hi-Dive) caseback indicates that this case configuration is 121ATA rated and the literature states it as 120ATM rated, it is necessary to understand the difference between those two measurements of pressure. Physicists defined the ‘atmospheric pressure’ we live in at sea level (14.7psi) as a single unit of measurement abbreviated as 1 ATMosphere ‘ATM’. As we ascend, the air gets thinner and the pressure around us drops. 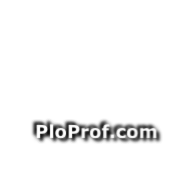 Like air, water causes pressure by its weight acting upon any item within it but water is considerably denser than air, so the pressure changes more rapidly in relation to height. In order to reach the equivalent of an additional ATMosphere worth of pressure in sea water, one needs only to descend 33 feet or 10 meters. However, the original atmosphere of 14.7psi (or 1 ATM) is still present on the surface of the water, so for instance at 1ATM’s worth of depth we need to also factor in this extra 1 ATM of the air above the water, giving a total pressure of 29.4psi. To avoid confusion, when people discuss pressures underwater they often use the unit ‘ATA’ (referring to "ATmospheres Absolute") to represent the total ‘absolute pressure’ caused by both the water and the air above the water. This means that 120ATM = 121ATA. Bet you wish you’d not noticed that these two measures appeared on the watch now! The watch dial is said by Anonimo to be ‘extra thick’. It is not fully understood what that means, or why it is desirable, but the matt background and dial printing are superbly done. The Polluce dial layout is based on that of the Millemetri, in a classic 3, 6, 9, 12 configuration with triangular markers. The date window is located at 4 o’clock which helps keeps the dial layout symmetrical. Had the date window been at either ‘3’ or ‘6’, the full printing of the large numbers would have been disturbed. The watch uses a white on black date wheel for black dial models (black on white for all other variations) to further keep the date from intruding on the dial. The CNS and MC logos on the 2006 and 2007 models are very nicely produced with the glossy red ‘M’ of the MC logo being a nice touch that stands out under scrutiny. In pictures these logos give the appearance of a very busy dial but they figuratively ‘pale into the background’ to become almost unnoticeable in use. On the 2008 models the red of the ‘10 Anni’ logo provides the highlight that the ‘M’ on the earlier models did. The 2006/7 model’s baton hour and minute hands are reminiscent of certain Panerai models and are said to be rather thin when viewed in photographs of the black dialled watches.  This is actually an optical illusion due to the hands having black surrounds which means they blend into the background on that dial colour. The thread central seconds hand is similarly treated with a black shaft, allowing the user to see only the round tip in use. The hands are effective and work well with the overall design and telling the time is simple, both day and night. The 2008 '10 Anni' models used different hands. These partially open hour / minute hands with luminous tips and arrow second’s hand are not considered by many to be as pleasing to the eye as the previous style. 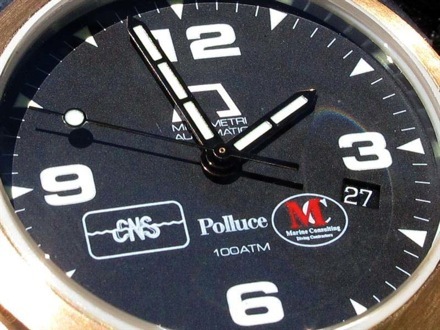 The 5 minute markers and the numbers are treated with a luminous coating. Initially after lights out they do not appear to be as bright as the hands. The hand luminosity soon calms down and the overall brightness evens out with the glow lasting the full night. It is very easy to quickly distinguish the time at night, as the filling on the hands is made up of bar-like equal lengths of luminous compound. The hour hand has two such bars and the minutes hand has three, easily avoiding any confusion between the hands, when telling the time in darkness. 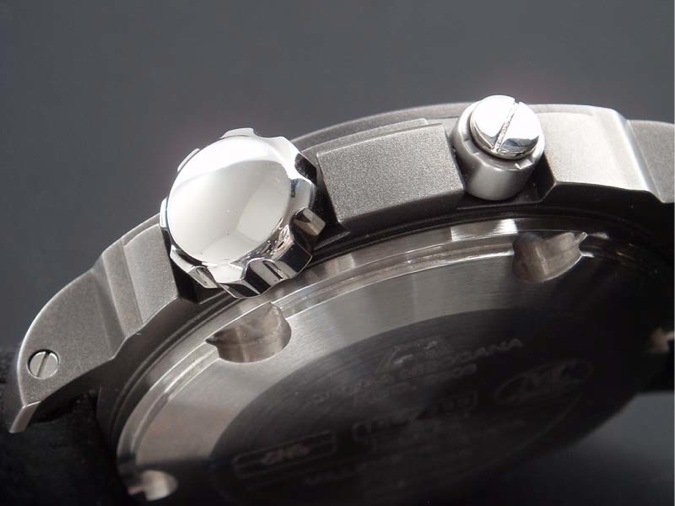 These watches use an Automatic Anonimo caliber 01.0 movement. Anonimo state that this caliber is based on either a Sellita SW200 or ETA 2824-2. 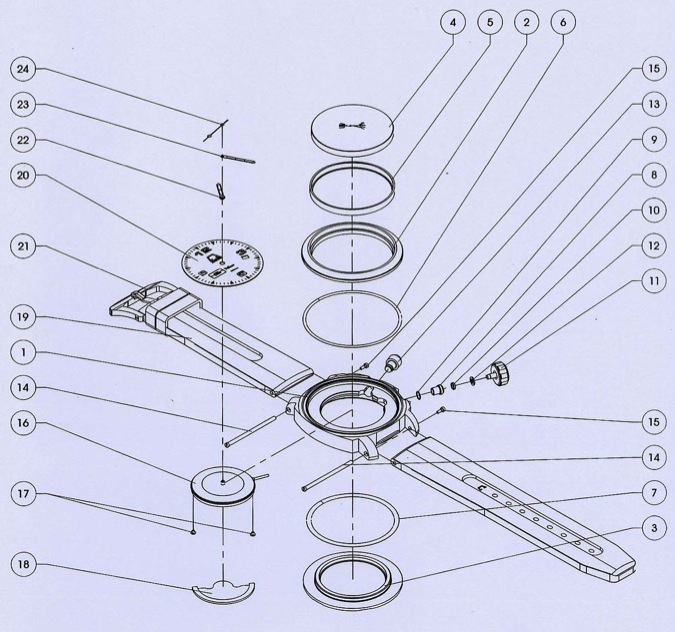 In both cases the rotor is finished to Anonimo specifications, the movement adjusted to 4 positions and given a colimaçon finish. Colimaçon is French for ‘spiral’ and this finish is one of the traditional movement decorations. It is thought that the earlier Polluce models employ the ETA based movement, but as the Sellita SW200 became more readily available, Anonimo switched to this calibre instead. Certainly this theory is borne out by the later edition ‘Steel Bracelet’ model being specified by Anonimo as using only the SW200. Whilst the ETA 2824-2 movement is well known to most WIS, the SW200 is something that many do not yet know much about, due to its relative newness in the market. 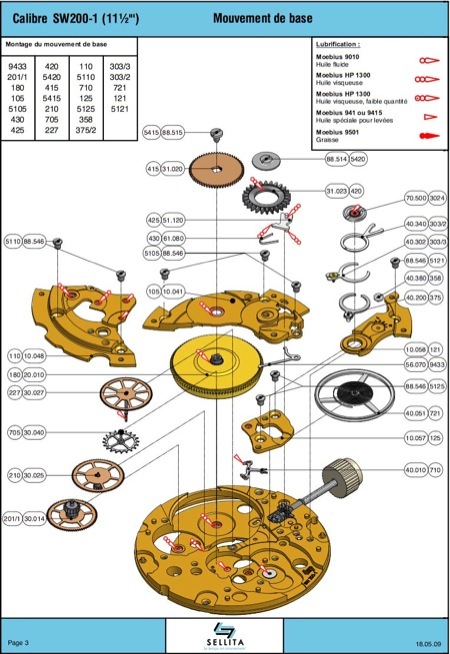 The movement is Sellita's answer to ETA's proposed change in it's business model (publicised in the mid 2000's) to move to only supplying fully assembled movements and ceasing the supply of ebauches (partial movements) by the end of the decade (i.e. 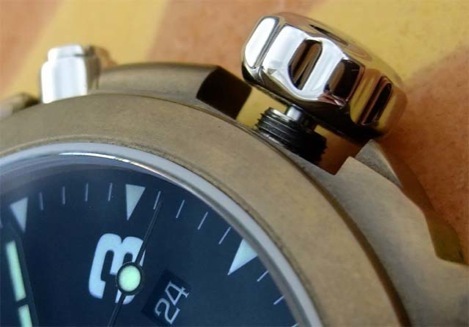 by 2010) Naturally, this decision proved a serious problem for many watch manufacturers as ebauches are purchased by most brands for at least some of their model range, including the likes of Omega, Breitling and IWC. Ebauches can be customised simply with the addition of brand specific decoration, or can be combined with modified parts of the brand's own design/manufacture, for example as in the case of IWC. The 2006 Polluce watches were delivered in the larger, older style, Anonimo boxes that ape the Panerai box set. Each watch was also delivered with one of two types of wrist strap. One being a vanilla scented rubber diving strap, which Anonimo state uses NBR (Nitrile Rubber) as its prime ingredient. The other is calfskin that is manufactured and hand finished using Anonimo’s patented impregnated ‘Kodiak’ process. This allows the leather to be immersed in fresh, or sea, water for up to 24 hours. 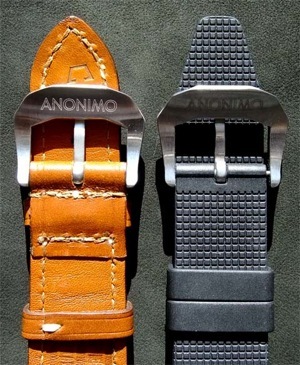 Anonimo developed this manufacturing technique with its strap maker as most leather is not resistant to water, especially salt water. 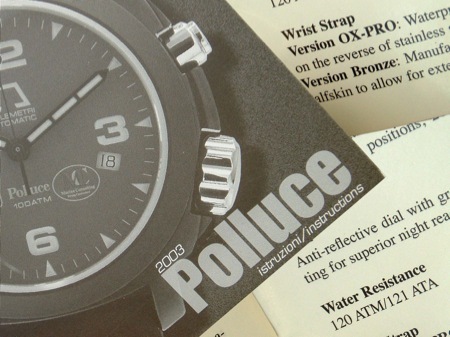 Original (2006) Polluce models were supplied only with Kodiac and rubber straps and did not come with a bracelet option. This was remedied in 2007 with the ‘Steel Bracelet’ model. However, early adopters sought a bracelet option and the lack of a defined bracelet fitment from Anonimo led owners to thinking laterally. 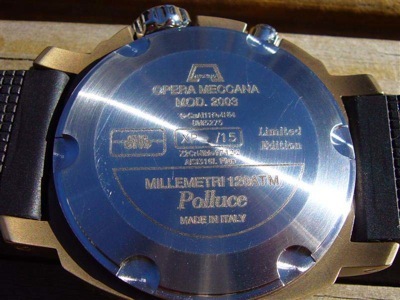 The Polluce case is exactly the same as the Millemetri, Hi-Dive, Day-Date and Cronoscopio models with respect to the lugs, so there was no reason why the bracelet sold for those other models would not fit the Polluce case. The bracelets are made up of sixteen single removable links, every link having its own screw pin. These pins hold a lot of weight with the watch head and the bracelet. They need to be Loctite’d in place or they can loosen during normal wear. The undisturbed links should not be an issue as they will have had threadlock applied at the factory. 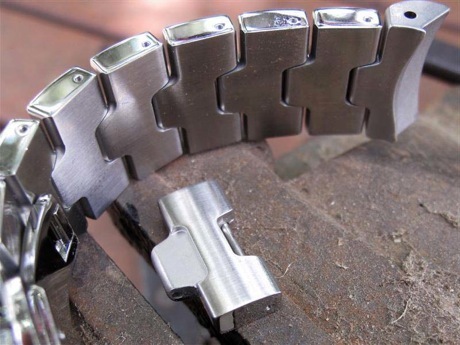 It has been noted that links that have been disturbed by a watchmaker when sizing the bracelet or by ultrasonic cleaning, have a tendency to work loose. In light of this all owners should check their pins regularly. Anonimo didn’t just ‘play safe’ with the materials, instead they ‘pushed the envelope’ and made a watch with a case material that no one had ever used before in the case of the bronze model. They then built this version alongside other equally innovative models to create a range of related watches with different case materials, including the companies' first use of gold. Looking at the work that went into the product one can see that the company was very serious indeed about making a statement about the way they felt about their part in the salvage of the Polluce, marking the event with not just one redialled watch from the existing range but instead introducing a new range of high quality watches. The incredible attention to detail mentioned earlier regarding the flagship Two Tone model, makes this watch easily a class leader. 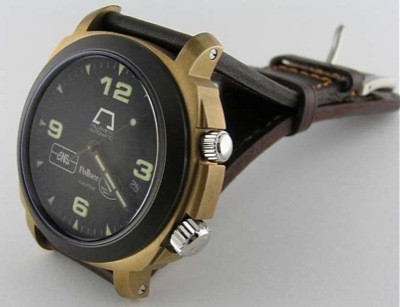 The bronze cased versions age beautifully as time goes by, the patina adding to the allure of that watch. 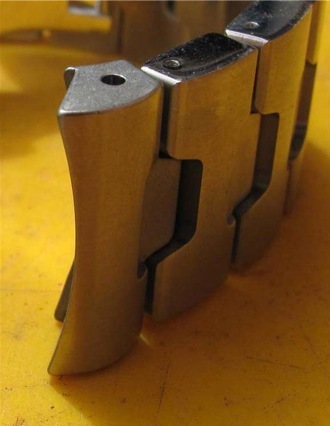 The OxPro/Drass treatment’s unique finish providing a real alternative to the more fragile PVD process, typically used by other manufacturers. 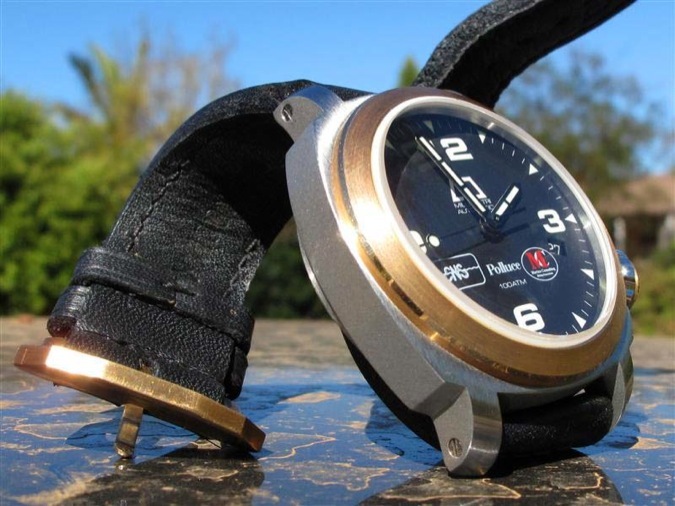 With this in mind, Anonimo utilised a AISI316L-Plus stainless steel back for the bronze cased models to avoid any issues with the bronze material (and its associated oxidisation) contacting the wearer's skin. Another reason for the stainless back could also be the high nickel content of UNI5275. Nickel is an important cause of contact allergy as some unfortunate Rolex wearers have discovered, due to the high nickel content 904L stainless used in that manufacturers watchcases. When looking closely at an item finished in Ox-Pro, one can still see the original surface texture of the base material. The finish looks metal or metallic, very different from an overlay or coating. The advantage of this treatment is that the watchcase has a more durable finish that will not chip like traditional coatings. In normal use it behaves as any other stainless steel object and small scratches can be lightly polished out. Naturally larger knocks that cut deeper into the stainless can expose the lighter coloured metal beyond where the process could reach. Anonimo later refined the process re-naming it Ox-Pro B. Drass Galeazzi, an Italian diving equipment manufacturer, commissioned a special edition of the Millemetri with this finish as it matched the colour of many of their products. In recognition, this variation of Ox-Pro is now referred to as Drass. The Drass is finish is a unique look. It has a very gunmetal appearance, with a hint of submarine steel, Ti and ceramic thrown in. It is much more refined and elegant than the rather sooty appearance of the original Ox-Pro. What might surprise readers and please those with smaller wrists, is that these watches tend to ‘wear smaller’ than their width measurements would suggest. The watch is a full 44mm wide but looks and 'feels' more compact than the same size Panerai. This could be due to the lower height (due to the very flat case back), or a visual trick due to the 22mm lugs. Either way it makes the watch very easy to wear in all situations and as one commentator said, "there is no need for great ‘hams’ to pull this one off!" The Polluce uses the Hi-Dive crown and HEV configuration. 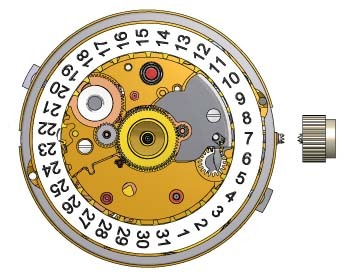 It is the dial that therefore seems to be a misprint, due to the fact it is based on the Millemetri layout. Some commentators have found this mistake to be unacceptable in a modern limited edition watch at this price point, but ‘c’est la vie’… these things happen – and it adds to the watch’s charm. It has to be said that the Kodiak straps do work very well in water. The leather certainly appears to be unharmed after wearing in the ocean, swimming pools or from sweat on hot days. The straps have also been DeskDiver tested in snow and in an ultrasonic cleaner without any ill effects or marks showing on the straps. Please note: It is not advisable to use an ultrasonic cleaner for cleaning leather straps as it is too aggressive a method. 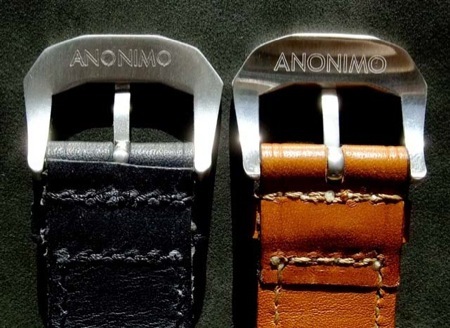 Anonimo maintain that all their leather straps are created by the Ciampi family in Castelfiorentino in Tuscany. As with other parts of the Anonimo business, focus is on quality and not quantity with the company producing around 4000 Kodiak straps annually. Whilst the straps are fully handmade, stitching is done using a sewing machine. Like all leather straps, in the first day or two wearers may find the Kodiak strap fairly stiff and occasionally uncomfortable. Given wear, the strap will soon mould perfectly around the users wrist and become more supple up as it wears in. The straps are strong, solid, reasonably thick and feel more ‘handmade’ than other manufacturer’s supplied (OEM) straps and this helps contribute to the classy look and feel of the watch as a product. Many leather waterproofing treatments reduce leather porosity (as the process includes chemicals and additives that can block the leather’s natural pores) and/or can compromise the structure of the leather. This is not the case with the Kodiak process which uses a vegetable and resin mixture which allows the leather to maintain it’s porosity allowing water molecules to pass through the leather during immersion. 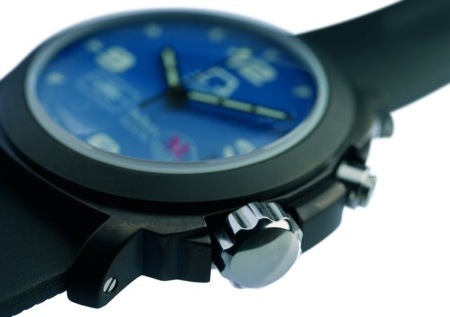 Anonimo say this strap’s water resistance capability allows the watches “to link fashion with function”. That may well be true, and the straps look and feel like quality products. When inspecting these watches closely, one catches little hints of the Anonimo logo all over the watch. 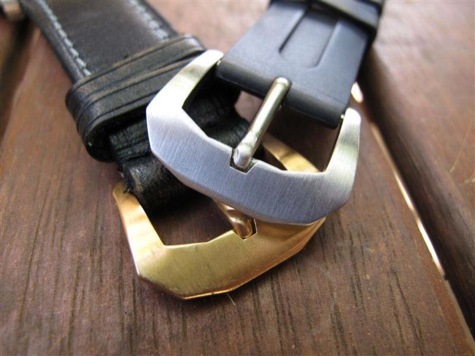 These are very well integrated into the design and the buckle is one of those areas. 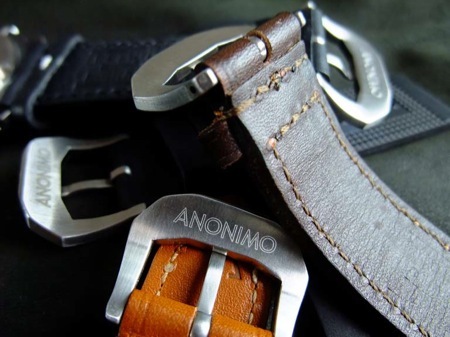 This particular hint at the logo is simply the tang notch, where the tang fits into the buckle, which is milled in the shape of the stylised A of the Anonimo logo. All Anonimo straps feature thick bespoke buckles, which some have asserted may owe their design origins to Panerai as the shape is similar. 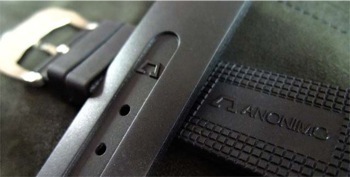 However, given the parameters of buckle design, a truly unique product is nigh on impossible and all buckle designs could be said to ape one another in some way. All straps supplied with the Polluce models were delivered with stainless steel buckles, apart from the two tone (ss/au) model which uses a solid 18ct rose gold buckle. It is clearly stamped with the 750 hallmark and as you would expect given its solidity, the gold buckle is satisfyingly heavy. The retrofit bracelet can easily be recognised due to its use of a double deployment clasp with pushers on both sides of the bracelet. 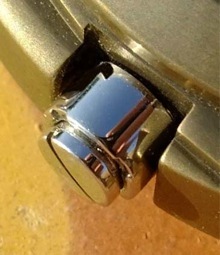 Some owners experienced issues with regard to the clasp and also with the link screws. It would appear that when new the clasp could occasionally open during more strenuous use, more often than not when being worn during sport. 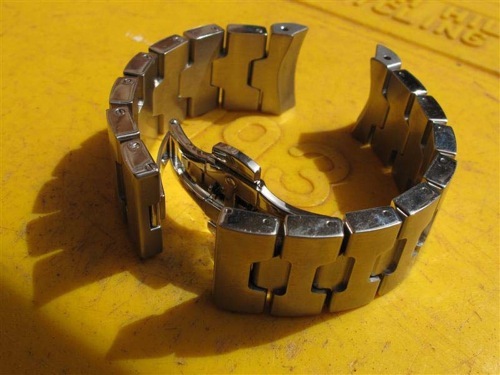 Owners reported that this issue subsided after a few weeks of daily use, as the links wear in and the bracelet becomes slightly looser on the wrist. It would appear that the tighter the user wears the bracelet and the closer the clasp is to their wrist joint, the more likely the clasp could open accidentally. This is due to the wrist joint depressing the ‘hand side’ deployment button just enough to release the clasp. 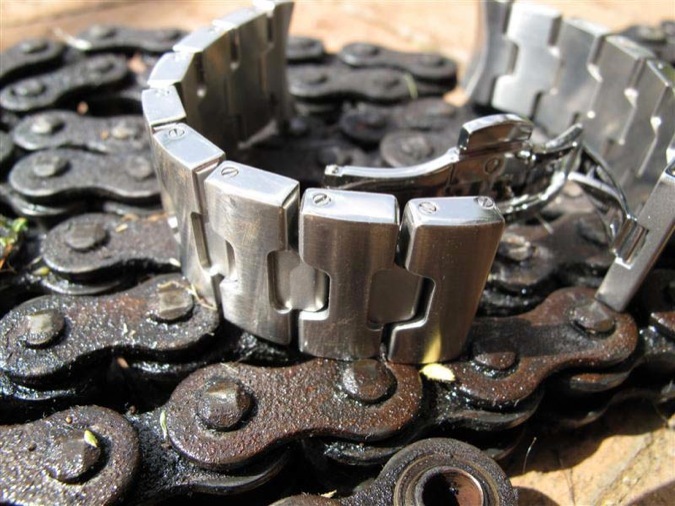 In 2006 the retrofit bracelet cost around US$1400. It is huge, heavy and thick being made from solid stainless steel ‘ingots’. Each link having a hint at the Anonimo logo where it joins its neighbours. The bracelet is cleverly designed, well made and not at all over the top. One could say it is almost 'understated'. Hand finishing takes longer and is of course more expensive than using machinery, but Anonimo believe this enhances the quality of the finished product and means that each watch is unique due to it not being an exact copy of the previous one, unlike the majority of cast or CNC fabricated watchcases. On the 29th October the last artefacts were returned to the surface and the diving team began 103 hours of decompression, 1 hour for each metre of the working depth. the seabed crew finally leaving the hyperbaric chambers on November the 3rd 2005. Only the second time ever such saturation techniques had been used on an archeological and non-commercial project. In April 2007 at the Basel show Anonimo announced that they would release a new Polluce model for 2007 called the ‘Polluce Steel Bracelet’. This model used an all stainless steel case and was available in a run of 300 watches, with 150 blue dial and 150 black dial. 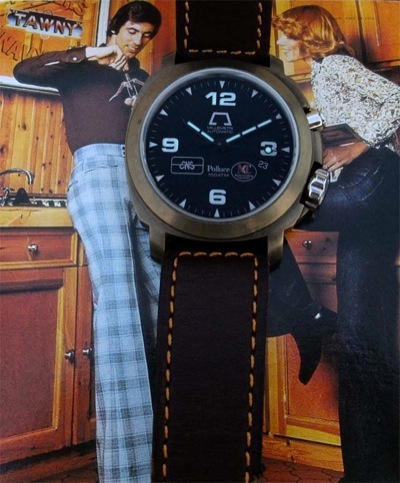 The success of the initial Polluce models led Anonimo to release a second edition of bronze cased Polluce watches in mid 2006. This time the edition was of 150 pieces and used the black dial as fitted to the original release two-tone model - Retail US$3,200. RRP was the same for both colour variations at US$3,995. These watches all came fitted with the new generation Anonimo single pusher bracelet clasp with single hole fine adjustment and were delivered in Anonimo’s new style wooden box. • All models: AISI316 Plus stainless steel back cover. Screw locked bezel and back cover. Screw locked large stainless steel crown. Automatic helium expulsion valve. • Bronze (model 2003-BNZ and an2003-BNZ): Sand-blasted and satinised watch case and bezel manufactured in a UNI5275 bronze alloy. • Ox-Pro (model 2003-OX): Sand-blasted AISI316 Plus stainless steel watch case and bezel treated with Ox-Pro blackening process. • Steel & Gold (model 2003-SSG): Sand-blasted and satinised AISI316 Plus. 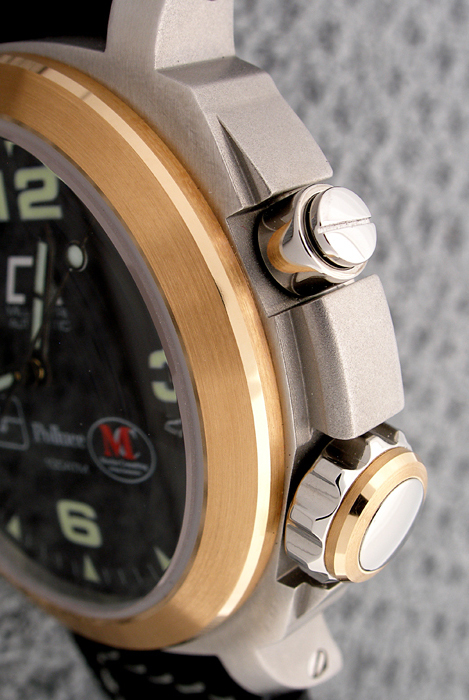 Bezel in gold 750‰ with supporting structure manufactured from AISI316L stainless steel. Crown with external ring in gold 750‰. 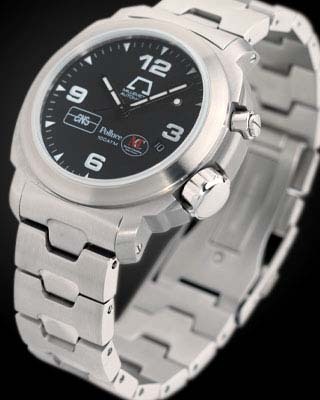 • Steel Bracelet (model 2003-BRC SS): Sand-blasted and satinised AISI316L watch case. 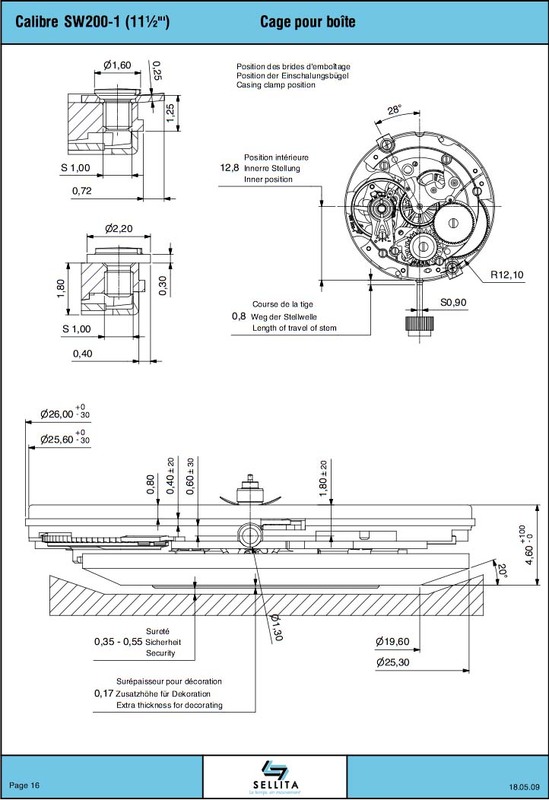 • Drass (model 2003-DR): Sand-blasted AISI316 Plus stainless steel watch case and bezel with Ox-Pro B blackening treatment and passivation process. 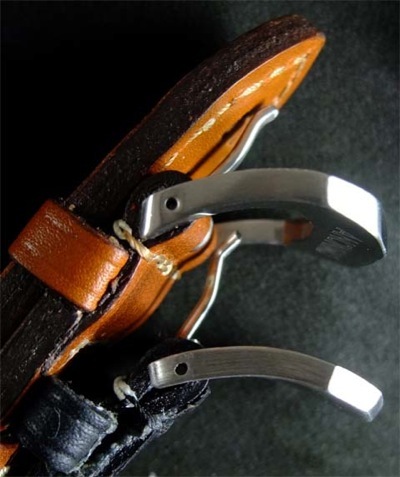 • Calfskin strap manufactured with patented Kodiak process. Anonimo engraved on reverse of buckle. 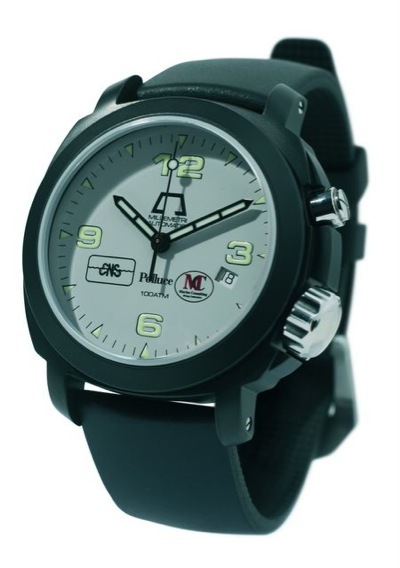 • Black rubber strap manufactured from Vanilla scented Nitrile Rubber with Anonimo engraved stainless steel buckle. •2006 - Optional Anonimo bracelet - Exclusive Anonimo design with brushed links (satinised indents) and polished sides. Security deployant clasp with double release push buttons. 16 links which are all removable and pivoted on long screws, solid end links. • 2007 - ‘Steel Bracelet model’ bracelet - Exclusive Anonimo design with brushed links (satinised indents) and polished sides. Security deployant clasp with a single release push button. 16 links which are all removable and pivoted on long screws, solid end links. The bronze models differ from the previous Polluce’s in that they use the ‘10 Anni’ emblem instead of the CNS & MC logos. The 10th anniversary models also sport a new hand set (the same as those used on Anonimo’s Marlin, Sailor Diver and Dino Zei San Marco). 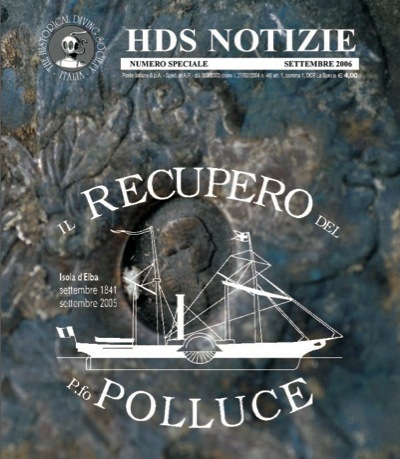 The left hand side of the Bronze cases is engraved with a drawing of the ship and the words ‘Polluce Final Edition’. Prices were US$3,950 for the Drass and US$4,200 for the Bronze models. 2008 brought with it Anonimo’s 10 year anniversary and to celebrate it, new Polluce models. 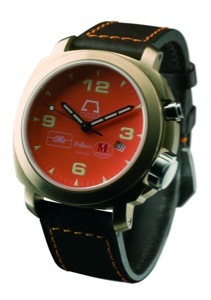 A Drass model based on the 2006/7 style, of 150 pieces and a brace of refreshed bronze cased models with a choice between orange or black dials, with 198 pieces of each colour. To illustrate this point, two of the 2006 Polluce production models were available as a pre-release in limited numbers. 10 watches were available with the bronze case and the orange dial, their serial numbers were prefixed with the code ‘P’. 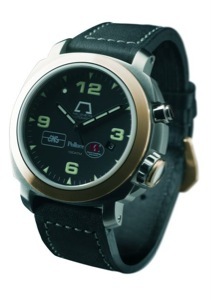 Anonimo also released 16 bronze cased, black dialled versions prefixed with ‘XP’. In 2003 COMEX returned to the site and sent an ROV to dive on the wreck. They discovered that it had been almost totally destroyed by the British expedition’s bucket dragging method of excavation and little of the Polluce remained. 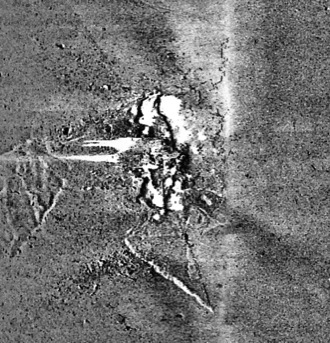 As can be seen in the before and after SONAR scans above, the damage was catastrophic. 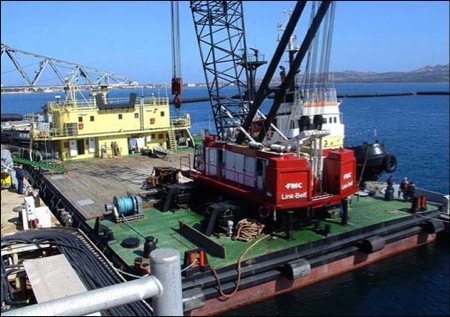 Recovery started on the 14th October 2005 with the team employing saturation diving techniques using the Marine Consulting srl “SUZY II” modular saturation diving system. 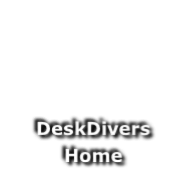 This comprises of a diving bell for two divers with a depth capacity of 200 metres and 2 hyperbaric accommodation modules, each with a capacity of 4 people. The diving bell being launched and recovered by means of an hydraulic "A" frame and on surfacing, mated to the accommodation chambers to allow shift changes. Naturally, Anonimo looked to its existing dive watch designs when creating the new timepiece, yet this would not simply be a standard model with a 'commemorative' dial. Instead, Anonimo chose the best parts from their range to create a base design concept which comprised the Millemetri model's case with the High Dive model’s crown and automatic helium escape valve (HEV). As the watch was to be available in limited quantities with different case metals and dials, Anonimo made this design a model in its own right and the Polluce is referred to as Anonimo's model designation ‘2003’. 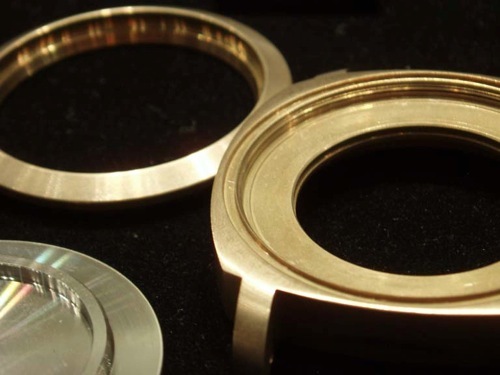 Unlike some manufacturers, Anonimo's watch cases are not cast but are instead milled from solid billets of metal or alloy. This work is done in the Tuscan town of Incisa using both traditional and modern methods/processes. Anonimo maintain that the focus in the factory is on quality not speed, with on average just 20 watchcases being made each day. Once complete, the cases are then taken to another small factory, in the town of Lastra de Signa, to be hand finished. The story then skips forward to 1995 when the specialist underwater company COMEX, located the wreck and filed the co-ordinates with the Italian authorities on the understanding that they were not to become public knowledge. However in 2000, whilst allegedly looking for a completely different wreck, a group of eight British divers located the Polluce and proceeded to raise the ship’s cargo. Using a crude ‘dragged bucket’ method to break up the wreck and expose the treasure. Obviously designed from the outset to top the Polluce range, the stainless steel and gold Polluce is the more dressy of these models and as such it has fantastic attention to detail on the case finishes. It is the watch that is most commemorative of the Polluce wreck as the gold elements were designed as a tribute to the gold coins and treasure, carried by the steamer. One point to note is that these are not easy watches to photograph due of the thick, domed, sapphire crystal. This difficulty is further compounded when photographing the Two-Tone model, where the contrast between the different surface finishes is a reflections magnet. For some time the Sellita company had made a good business from buying ETA ebauches and assembling them with various decorations and/or upgrades for their customers. When ETA announced that they would cease to sell these parts, Sellita was one of the companies that took ETA to court to lengthen continuation of supply. At the same time Sellita, worried they would not be able to supply their customers with a product going forward, decided to embark on development their own replacement for the ETA 2824, the result of which is the SW200. 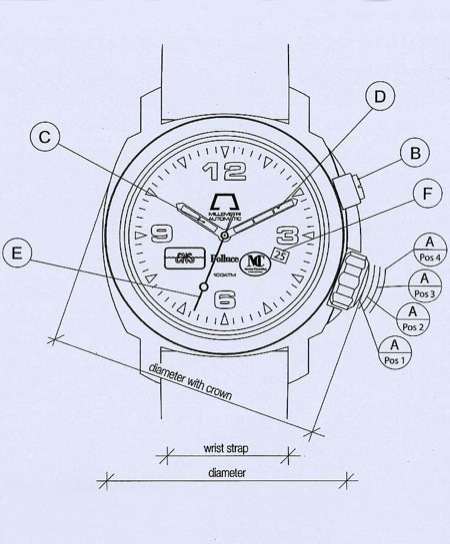 Whilst its design is based upon elements of the ETA2824, the SW200 is not a direct clone (for obvious copyright reasons) yet, it is common where it counts and Sellita planned to sell it fully built or as an Ebauche in their catalogue in place of the 2824 when ETA switched off the supply. Whilst the 2824 is still available and with this in mind, the SW200 is currently marketed as a ‘drop in replacement for the ETA 2824’. 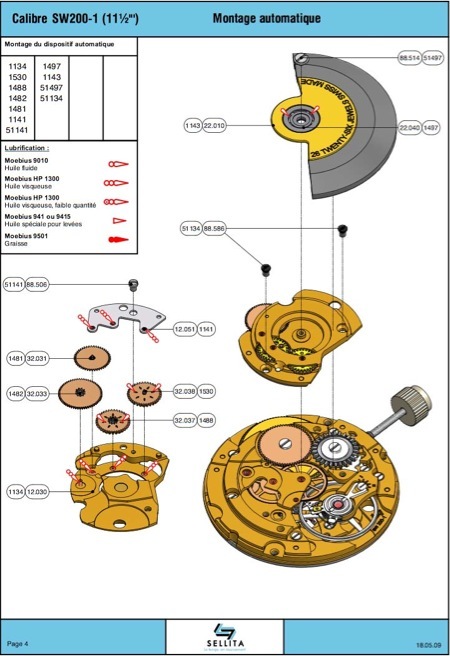 The dial feet positions and the stem heights (and possibly the stems themselves) are identical, to allow installation of ETA2824 specification dials, hands, movement rings etc. However the rest of the components of the SW200 are said not to be interchangeable with the 2824. This mention of the lack of parts interchangeability, has led to some commentators questioning future servicing if anything were to happen to Sellita. Yet it should be noted that whilst the 2824 has been in production for many years and there are a lot of donor movements out there, that supply is also not inexhaustible. Alongside that fact, is the worry that the 'service-ability' of the 2824 movement could also soon be an issue. This is because ETA suggested that along with their cessation of ebauches supply, there would be a similar stop placed on spare parts supply to the servicing industry, with service and repair of their movements only allowed in ETA’s own new worldwide service centres. Whilst the uptake of the SW200 has gathered pace, with many brands utilising the movement instead of the 2824, the threat from ETA to reduce spare parts supply has so far has come to nothing and supply of ETA parts still appears to be strong. Perhaps there are a number of factors (including global recession and possibly even the success of the SW200) that caused a softening of ETA’s decisions regarding parts supply and the 'one stop' service shops. Naturally, the ETA and Sellita information affects not just Anonimo and the Polluce. 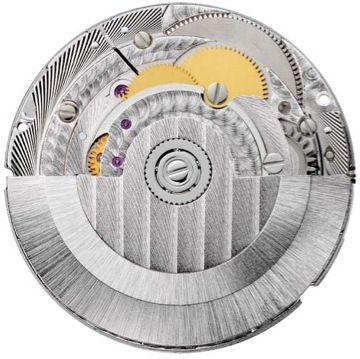 There are plenty of other watch manufacturers using these movements (e.g. Oris, Hublot and Breitling) and it should be borne in mind that all Polluce models are fitted with a quality Swiss movement that has long service intervals and currently enjoys good parts supply. With gentle persuasion Anonimo Authorised Dealers accepted requests from owners to retrofit the bracelet from those other models to the Polluce. Most of those orders came from owners of the Two-Tone model, as that version has a stainless steel case. Obviously, the bronze cased Polluce and a stainless steel bracelet would look like an afterthought. Since each Anonimo case is hand finished, fitting the bracelet was not as simple as with other brands, owners were requested to return their watch to an Anonimo service centre to have the bracelet fettled to fit the case. Occasionally this took many weeks with the watch being sent back to Italy for the work to be completed. Whilst they are a brave set of quality watches, it should be noted that no one quite knew what to expect when they were first released. 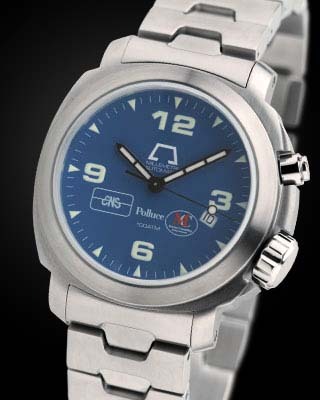 It should be remembered that when these watches came to market, awareness of the Anonimo brand was still gathering pace. 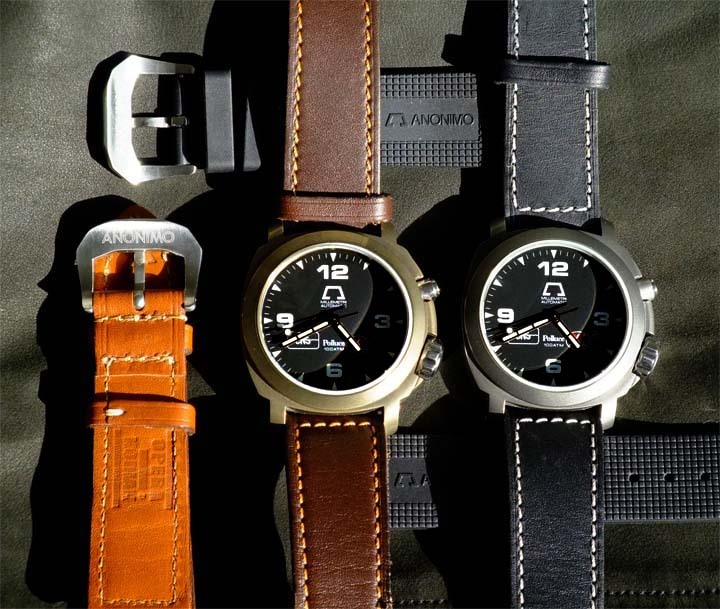 These watches serving to underline Anonimo's journey to date, planting a firm stake in the ground regarding the brand's quality, innovative design and use of materials. Since the first release of the Polluce models, brand awareness has risen dramatically (some say in part due to the Polluce models) and edition size of the subsequent model releases increased to fulfil that demand. When considering acquiring a Polluce today, it should be noted that these watches were released in limited numbers and their limited edition status, along with the upsurge of interest in the Anonimo brand, has meant that these watches are now very sought after. 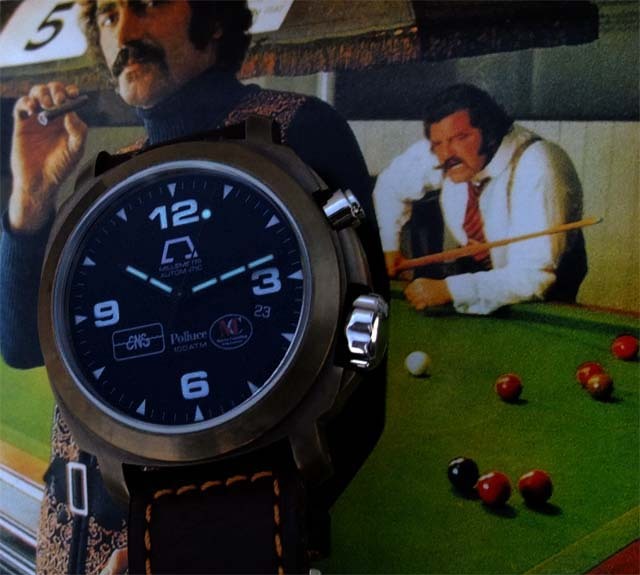 The later editions of the Polluce quickly sold out and now all models of these watches are commanding strong money on the used market, something that was not always a trait enjoyed by Anonimo models of old. As Anonimo grows as a brand, these models will continue to be sought after and their rarity means that they may increase in value over time. Anonimo made a strong statement with the Polluce watches and in the process upped their game to new levels. That said, with these watches Anonimo truly achieved personification of their philosophy, with each Polluce model allowing us to glimpse the personality of the wearer. As you might expect having read this far, living with a Polluce is a ‘Pol-leasure’. 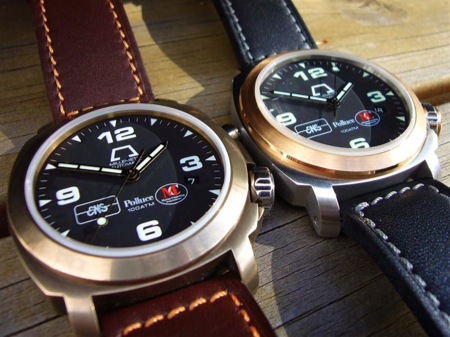 The design and engineering on these watches is superb. It is obvious that Anonimo really thought about what they wanted to achieve with this commemorative edition and seem to have approached creation of these models as a no expense spared exercise. At least one design of a Polluce that did not make it to production has come to light. 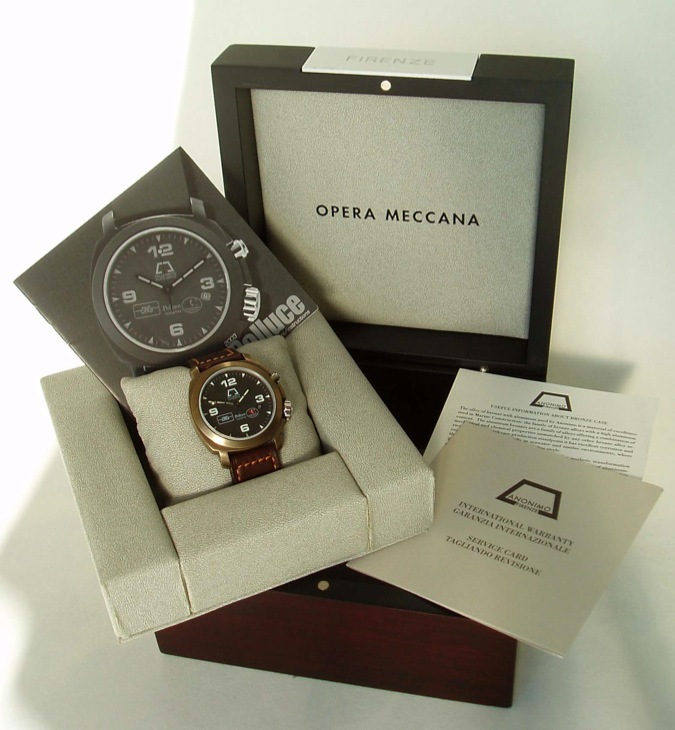 With bronze case and black dial, the watch was also equipped with the stainless steel Millemetri crown and manual HEV and fitted with an Ox-pro bezel. It is not known whether this watch was a unique piece or if it was part of a series. 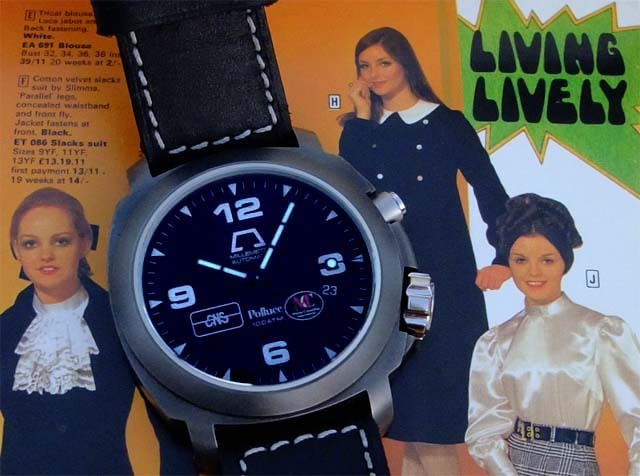 Anonimo later offered a new design of bracelet for the Polluce models that did not use the double button clasp. Instead using a simpler Z deployment which is operated by a single button. This is the same bracelet which was supplied as standard fitment to the 2007 'bracelet' Polluce models. In the years that the Polluce was in production Anonimo made detail changes to the design and manufacture of both their buckles and straps. Whilst when given a cursory glance they appear to be the same, this evolution can clearly be seen with close examination. More recent buckles are thicker and slightly more curved than the older versions and the ‘ANONIMO’ engraving on the reverse side is more clearly defined and in a slightly larger font. The early engraving appears to have been achieved using a rotary engraver, with small burrs from the tool showing where it was moved from letter to letter, when viewed under a loupe. Later examples are much cleaner, exhibiting no tool marks and are clearly engraved by laser. Strap construction has changed slightly too. 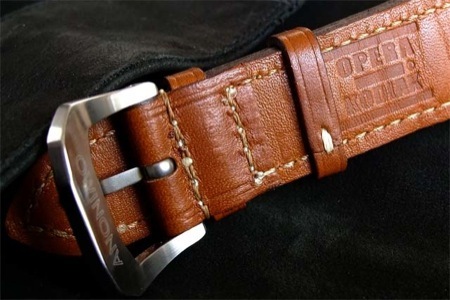 Whilst both old and new straps use a one piece, three fold method, the older versions have their buckle retaining fold hidden, yet the newer production runs of straps have an exposed buckle fold. Whilst this certainly provides a ‘cleaner’ look to the finished article it is perhaps not so comfortable in wear.